If nothing, a Tech education teaches its recipients to strive for more. This season, that effort has paid off for women’s tennis. Championship competition is drawing nearer. Though the season is coming to an end, there’s not much room for melancholy feelings at the top of the ACC leaderboard. Currently first in the conference, the Jackets have been victorious in every conference match this season. Not far removed from their recent victory over UNC, the Jackets have five matches left before the ACC Championship Tournament at the end of this month. Tech’s victory over UNC broke a 36-match ACC victory streak for the Tar Heels. Thought by many to be the toughest match-up of the year, the UNC match is now history. Tech will not lose its focus as the team prepares for ACCs and the NCAA championship beyond. Their success throughout the rest of the season will require maximum effort from each and every team member. With half the lineup in their debut season, there may have been some worries about inconsistencies throughout the season. However, there is not one freshmen in the lineup who did not enter her debut season without a history of success on the court. That success has been carried through the season to bring the Jackets to their 19-2 overall record. The success Tech has had this season is not all that surprising, despite the number of young players thrust into major roles. The four incoming freshmen were all ranked in the top 40 recruit rankings by Tennis Recruiting Network. With the help of more experienced collegiate tennis players, they have become a nearly unstoppable force on the court. Whether it is the support system that helped them adjust or the natural skill that they possessed well before stepping foot on a collegiate court, Jones and her freshmen teammates have helped to make Tech tennis into a team to watch on the national scene. The ascension of Tech tennis will depend on Jones’ continued development. Ranked first in the state of Tennessee and third in the southwest region as a high schooler, Jones has continued to improve throughout the season. Similar to Christopher Eubanks, Jones entered her collegiate career with a blue-chip prospect from the Tennis Recruiting network. Just like Eubanks, Jones has become an important part of Tech’s line up. This week she was named ACC Women’s Tennis Player of the Week after going an unblemished 3-0 last weekend against UNC and Wake Forest, both quality opponents. Jones plans to push herself in a specific direction. Though she is young, her aspirations are clear. Perhaps it is setting achievable goals that has done so much good for the Jackets this season, but it is more likely that positive attitude and grit that has made their goals easily achievable and not the other way around. Either way, Tech is on the road to ACC and NCAA championship competition, the goal for virtually every team as the season nears its critical point. The end of the semester is the most stressful time of year for all Tech students. Yet, this season the Jackets have proven that they will not bend under strain. With a 13-match winning streak already in the bag and a roster full of athletes that have no intention of losing a single match for the rest of the season, five more matches shouldn’t be too taxing for Tech. However, it seems the best has been saved for last this season. Three of the five remaining opponents are ranked in the top five of the ACC standings, which means the Jackets will not get any reprieve this month. Such is life in the Atlantic Coastal Confernce, one of the most difficult gauntlets any team must face nationally. Before beating UNC and Wake Forest, Tech was stuck in the middle of the ACC standings, below many of their remaining opponents. They must fight tenaciously every match if they want to defend their position in the standings. If Tech can continue their winning streak, they will be formidable contenders for an ACC Championship title and even an NCAA title. There is still a long way to go to reach that point. An unfortunate injury or an untimely slump can be the difference between holding a championship trophy and watching another team hoist it, particularly when the level of competition is so high. But there is something special about this team. 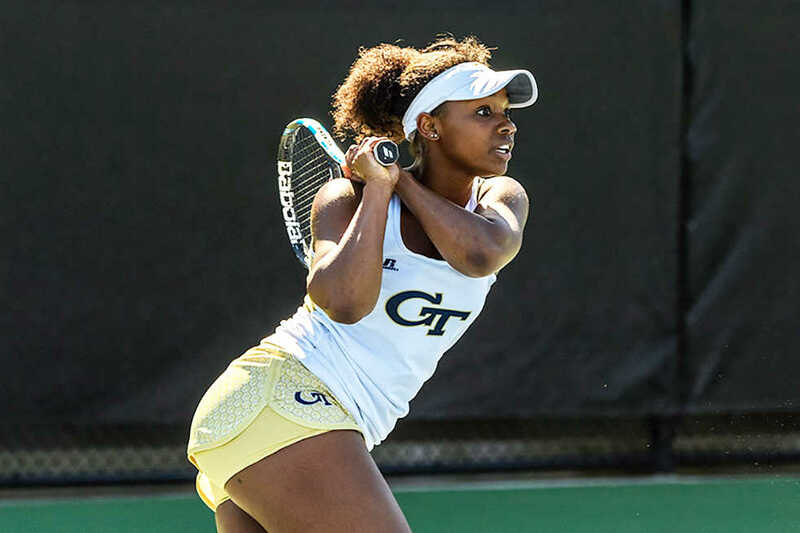 Demonstrating wisdom and patience beyond their years and keeping expectations simultaneously ambitious and measured will ensure that Jones and the rest of Tech’s women’s tennis team are prepared for the most rigorous, trying stretch of the season. It begins now.